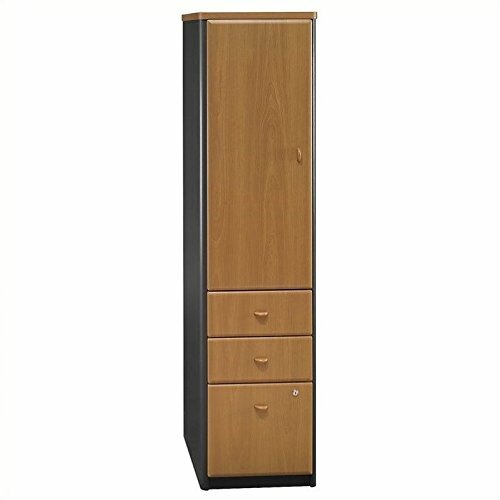 File away your worries with the Bush Series A Locker, a gorgeous combination file cabinet and general storage area. This multi-functional locking file cabinet features a generous storage space above, letting you file your documents, store your supplies and even hang your coat. Features: Two box and one letter-size file drawer in bottom half of unit Two adjustable,removable shelves and coat hook in top storage area Levelers adjust for stability on uneven floor Non-handed door mounts on left or right side PVC edge banding resists bumps and collisions European-style, self-closing, adjustable hinges Available in different finishes Locking drawer Overall dimensions: 66.3" H x 16.6" w x 20.6" D The American National Standards Institute (ANSI) and the Business and Institutional Furniture Manufacturer's Association (BIFMA) work together to produce voluntary standards that provide a common basis for evaluation of product safety, durability and structural adequacy. Bush Furniture meets ANSI,BIFMA standards and is considered appropriate in quality and durability to meet the demands of commercial office use.